When our company was founded in 1993 by a licensed Motorola radio repairman and a former New York City Paramedic, the quality and availability of radio straps was very limited. The radio straps offered by two-way radio manufacturers, if available at all, were inferior and less than the quality that we believed an emergency worker should use to carry life-saving equipment. Because purchase of the FDNY strap was limited to New York Union Firefighters, our CEO directed production of the first Handy-Talkie Strap with a leather loop in place of the Motorola hang up clip. This new design allowed any firefighter carrying any brand of two-way radio to have the same type of advantages that the FDNY strap provided to New York Firefighters. We called this new strap the RadioTech Universal Radio Strap™ and today it remains the original standard for universal radio straps. In March of 2003, a Pelham NH firefighter visited our showroom looking for the Universal Radio Strap when our team noticed his NEXTEL cell phone. Realizing that the Universal Radio Strap was not the best way to accommodate all of this firefighter’s equipment, we worked with him to design what became known as the RadioTech Communicator Strap™. In May of that year The RadioTech Communicator Strap was adopted by Orange County Fire Rescue in Florida and has since persisted as the standard model for radio straps used by departments across the country. Our design innovations continued in 2007 when the Chicago Illinois Fire Department requested modifications to the Communicator Strap to accommodate additional safety equipment. The redesigned model offered 3 leather loops to hold radio equipment as well as air packs and air masks. We credited this innovation to the Chicago FD and named the new strap the RadioTech Original Chicago Style Strap™. Today we provide both these standard strap designs as well as custom designed straps for firefighters, emergency workers, departments and municipalities across the country. Every strap we create is made with care and precision, because we know that each one carries equipment that saves lives. What is an FDNY Strap? The initials “FDNY” refer specifically to the New York Fire Department and the strap associated with carrying their standard Motorola brand two-way radios. The FDNY Strap was originally available only at the FDNY Union Shop in New York City to their union firefighters, but today these style straps can be purchased both online and at industry events nationwide. A true FDNY strap has a Motorola hang-up clip riveted right below the shoulder. The user may turn the head to communicate, hands free. The Motorola hang-up clip allows the user to quickly connect and disconnect the speaker mic via the Motorola button assembly mounted to the speaker mic. Until 2004 this button assembly was only sold to FDNY by Motorola. This is why RadioTech created the Speaker Mic Hardware kit for individuals who wanted to use the Original FDNY style strap. 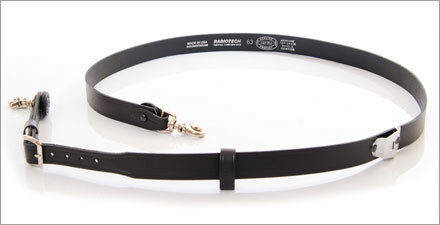 RadioTech™ offers straps in both FDNY and other styles. Each is hand-made of the finest quality leather and can be customized to any department’s specific requirements.